A tour bus bound from Bangkok to Ubon Ratchathani slammed into the back of a ten wheel truck in Saraburi last night. It is suspected that the driver fell asleep at the wheel. 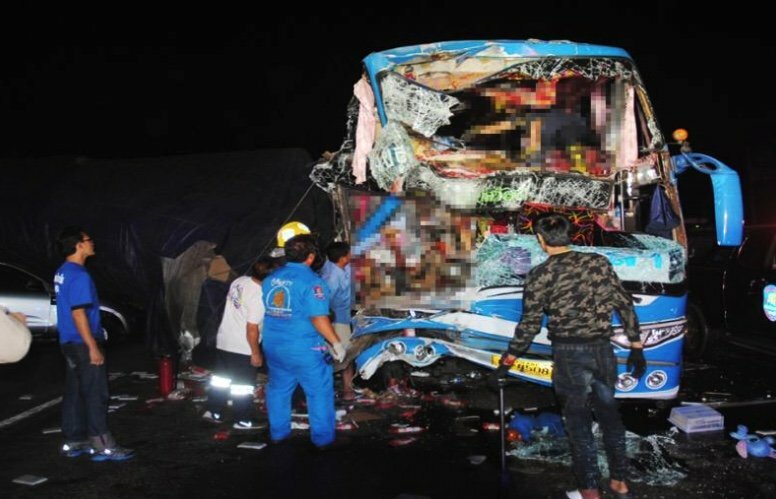 The driver of the "Ubon Air" tour bus was decapitated and 34 passengers were injured. Two are in ICU. The ten wheel truck ended up on its side crushing a family of six in a pick-up. They all survived without injury. The bus had left Mo Chit 2 bus station at 9.30pm with 41 passengers including several children. As traffic slowed to go over the bridge connecting Pahonyothin Road and the Friendship Highway the tour bus rammed into the back of the ten wheeler carrying a full load of grocery items. The tour bus made no attempt to brake. Rescue workers had to smash windows to help passengers get out. Daily News described a grisly scene at the front of the bus. The head of driver Attaphon Ekkapong, 38, from Ubon had come loose and fallen down in the bus. His limbs were also detached and his internal organs were splattered over the front of the vehicle. Khomsan Chertchu, 38, the truck driver from Ubon said he had slowed to enter the bridge. On his right was the pick-up. Bunjan Ob-un, 50, said he and a total of six family members were going to a wedding up-country. He said it was very lucky that they were not all killed. Pol Capt Sarot Ratanawirot of the Muang Saraburi police said there were no skid marks on the road surface. He is working on the assumption at this stage that the tour bus driver fell asleep at the wheel. Two women are in ICU in Saraburi Hospital. They were named as Primat Phuangjan and Earn Siripong. Ten men, 20 women and two children were treated for minor injuries. In the original Thai article, the report is even more graphic. Sadly this will continue to happen until proper restricted driving hours are implemented. Also what is wrong with reporters having to go into detail about what happened to the drivers body, sick bar steward who made this report. Alternatively they could increase the speed limits for buses. If they drive faster they will be on their destination before getting tired and accidents will be avoided. How about that Thai logic? Ughhh! . . . Perhaps our poetic songthrush of a PM could use this delicate line to open his next concert, before promising to make tachos compulsory . . . . before he takes another day off work would be good. Whats really scary is we only hear about those that fell asleep but how many out there right now micro sleeping? A constant battle of closing eye lids and then shocked back into reality for hours on end. Can it measure how much garbage he throws out the window too?